Network programming is notoriously hard to understand: one has to deal with a variety of protocols (IP, ICMP , UDP, TCP etc. ), concurrency, pac ket loss, host failure, timeouts, the complex sockets interface to the protocols, and subtle portability issues. Moreover, the behavioural properties of operating systems and the network are not well documented. 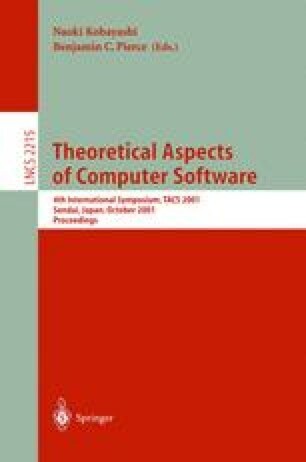 A few of these issues have been addressed in the process calculus and distributed algorithm communities, but there remains a wide gulf between what has been captured in semantic models and what is required for a precise understanding of the behaviour of practical distributed programs that use these protocols. In this paper we demonstrate (in a preliminary way) that the gulf can be bridged. We give an operational model for socket programming with a substantial fraction of UDP and ICMP,including loss and failure. The model has been validated by experiment against actual systems. It is not tied to a particular programming language,but can be used with any language equipped with an operational semantics for system calls — here we give such a language binding for an OCaml fragment. We illustrate the model with a few small network programs. F. Baker. Requirements for IP version 4 routers. Internet Engineering Task Force, June 1995. http://www.ietf.org/rfc.html. R. Braden. Requirements for internet hosts-communication layers, STD 3, RFC 1122. IETF, October 1989. http://www.ietf.org/rfc.html. S. J. Garland, N. Lynch, and M. Vaziri. IOA reference guide, December 2000. http://nms.lcs.mit.edu/~garland/IOA/. X. Leroy et al. The Objective-Caml System, Release 3.00. INRIA, April 27 2000. http://caml.inria.fr/ocaml/. J. Postel. User Datagram Protocol, STD 6, RFC 768. Internet Engineering Task Force, August 1980. http://www.ietf.org/rfc.html. J. Postel. Internet Protocol, STD 6, RFC 791. Internet Engineering Task Force, September 1981. http://www.ietf.org/rfc.html. A. Serjantov, P. Sewell, and K. Wansbrough. The UDP calculus: Rigorous semantics for real networking. Technical Report 515, Computer Laboratory, University of Cambridge, 2001. http://www.cl.cam.ac.uk/users/pes20/Netsem. The SwitchWare project. http://www.cis.upenn.edu/~switchware, 2001.